I guess you’ve been to an anime con then Father. 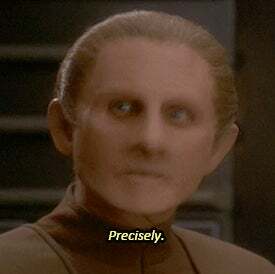 Did you know that René Auberjoinois, best known for playing Constable Odo in Star Trek Deep Space Nine, played the role of Father Mulcahy in the M*A*S*H movie? Before it was a long running TV series with the highest watched single episode ratings of all time, M*A*S*H was a movie directed by Robert Altman. The main stars of the movie were Donald Sutherland and Elliot Gould. However, a guy those who have watched Star Trek DS9 will recognize played the unit Chaplin, Fathert Mulcachy. That would be Rene Auberjoinois. The part didn’t have a lot of lines but he did in what I thought was a particular good comeback. 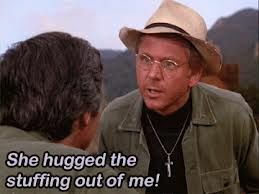 Hotlips O’Houlihan: [to Father Mulcahy, referring to Hawkeye] I wonder how a degenerated person like that could have reached a position of responsibility in the Army Medical Corps! Father Mulcahy: [looks up from his Bible] He was drafted. Broadwayworld.com did an interview with René back in 2013. He discusses his stagte work, his voice work in The Little Mermaid, and recounts working with Robert Altman. PC: What was the precise transition point for you to move into film during that period? RA: So, that allowed me to be able to do the feature film of MASH and then I worked with him for, gosh, another three or four films - I did MCCABE & Mrs. Miller, BREWSTER MCCLOUD and a little film called IMAGES, withSusannah York. But, yeah - that’s how I got started in film. After that, I worked a lot more on the West Coast and I started working in television, too - and the rest is a long, long story! I find it fun to see where the actors we know from their genre work started out. I wonder though, if during a DS9 filming where a director was questioning the way he was doing a scene if René just looked him in the eye and said “Excuse me, but I worked with Robert Altman. Did you work with Robert Altman?.....yeah that’s what I thought.”. I doubt it did but it’s a funny thing to imagine happening. So with that, I will close out today’s column and I will see you all on the next Fact Of The Day.